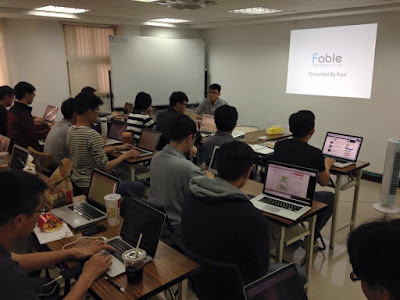 Paul Shih of Fable providing instruction and support to Jibao Team. Once upon a time, CEO Paul Shih of Fable visited Xceleration Labs and wanted to know how to market a CRM system that he had created for Sales Executives called SmartBoss. Together with his CTO and CFO, we explored various pivots to try to figure out how to market this CRM system to Taiwan and beyond (Hong Kong, Southeast Asia, etc). Areas of exploration included construction management, service personnel deployment or even management of Vietnam salespeople from Taiwan. All would have been excellent applications of Smartboss. Fable even partnered with one of Taiwan's top 3 job banks 1111.com.tw. In the end, we finally found Fable's North Star. At their core, they were really engineers interested in building great products and services. Although Paul believed in the importance of sales and sales people, at his core, Paul believed he was and team were more suited to project management and technical sales. And in doing so, they're partnered with many of the top outsourced teams in Taiwan as well as beginning the work of training the next generation of Taiwan software engineers. This means that they can scale up and down rather quickly depending on client needs. Paul Shih giving a lecture at recent Alpha Camp class. And of course, besides providing insight and talking about real world startup experiences, Paul is also authoring a series of blogs on ALPHA Camps' blog site. For more see Paul Shih blog. So if you have an most excellent idea or have started implementing an idea, but need more help. Why not give Fable a try? We would be glad to make an introduction on your behalf.